...... Bring your gaming to the next level with GameBoost. 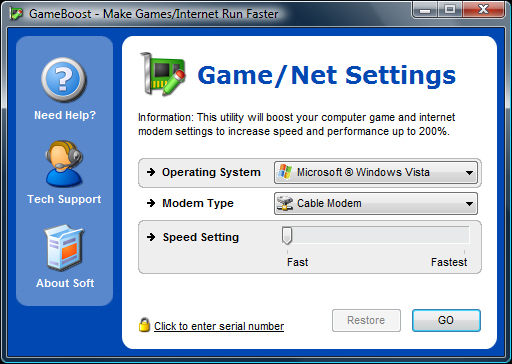 GameBoost will optimize your computer performance and internet connection to speed up web surfing and make your games run faster immediately. GameBoost is the combination of our two products GameGain and Throttle, offering both internet acceleration and gaming acceleration this all-in-one product can quickly enhance your computing experience with a single click of a button. Qweas is providing links to GameBoost 1.8.27.2012 as a courtesy, and makes no representations regarding GameBoost or any other applications or any information related thereto. Any questions, complaints or claims regarding this application GameBoost 1.8.27.2012 must be directed to the appropriate software vendor. You may click the publisher link of GameBoost on the top of this page to get more details about the vendor.